Ginkgo Oklahoma's newest Champion Tree. Planted late 1930. Location: Oklahoma City, north of 39th Street on Portland Avenue. Read more on the website of KVOR-TV Oklahoma City. Amazing experience! 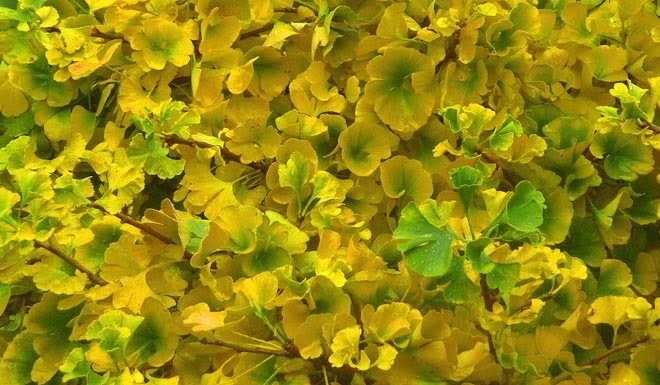 The leaves of this Ginkgo tree all fall withing 24-48 hours. Video by Powhatan School, Boyce, Virginia on YouTube. 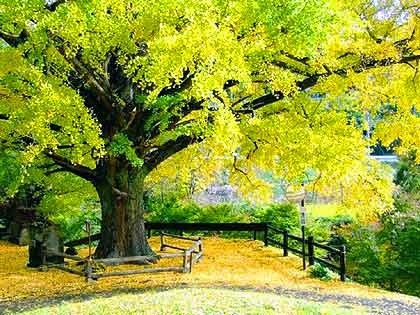 Wonderful video of many Ginkgo trees in fall. In this special period of the year the trees attract many visitors. Ginkgo Avenue, Hokkaido University, Sapporo in Japan. Cultivar Ginkgo biloba 'Mariken' in fall. Graft on about 5 ft stock. I took this photo in my garden, click on photo to enlarge. More cultivars are mentioned on my website: Tree-page.